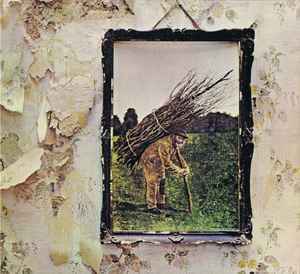 The fourth Led Zeppelin album, intentionally left untitled, with no indication it was by Led Zeppelin on original release - though many have commonly referred to it as "Led Zeppelin IV", "Zoso", "Symbols" or other unofficial titles. On Discogs the title of this release is "Untitled", unless specifically titled otherwise, i.e. "Led Zeppelin" or "IV" (as some later versions). All selection administered by WB Music Corp. (ASCAP). On CD: 8122-79644-8 Made in the EU. © 1971 Atlantic Recording Corporation, a Warner Music Group Company. Manufactured and marketed by Warner Music Group. On booklet: This Reissue ℗ & © 2014 Atlantic Recording Corporation, a Warner Music Group Company. Manufactured and marketed by Warner Music Group. Printed in the EU.